This week a colleague is leaving the company and because we like to eat, a potluck was organized for today. I could’ve cooked something, but then I would feel a bit bad posting it here if it didn’t involve an oven. I figured a simple bread would be unbearably simple. Muffins would be a bit weird for lunch. 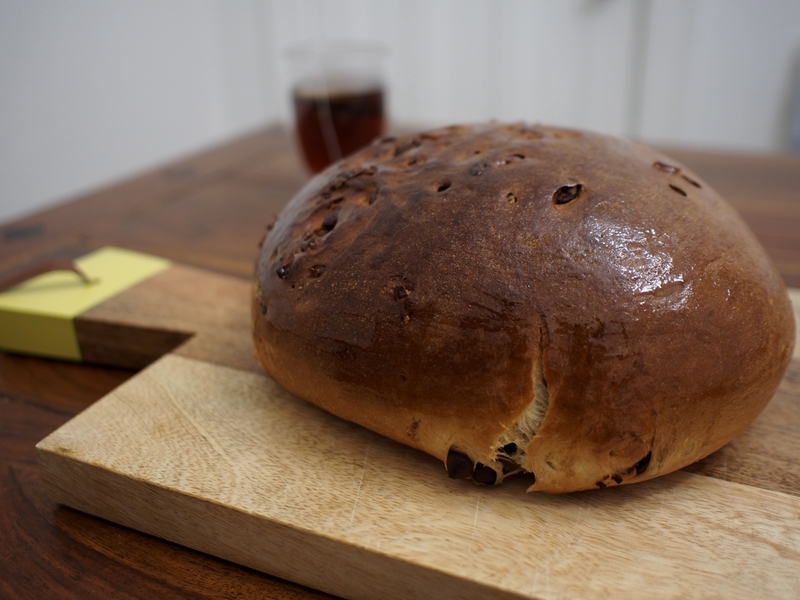 Then I opted for a cheese and onion loaf adapted straight from my favourite bread book. To avoid any trouble at home, I also baked one to keep, which is the one photographed for the purposes of this post. This loaf is now almost over, about 24 hours after it was first sliced. The main difference between loaves was the cheese. While for the personal loaf took a nice chunk of raw milk Gruyère, to take to work I went for a milder cheddar aged 18 months. 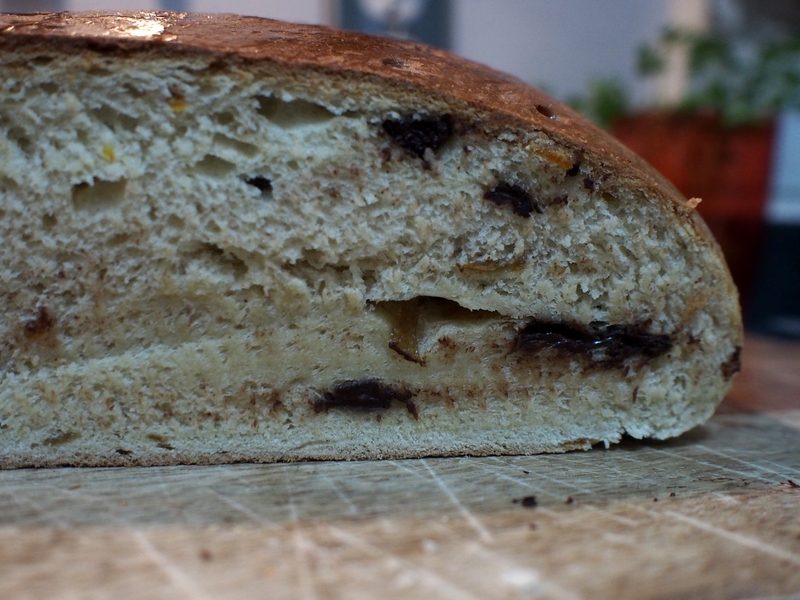 Also, I decided to leave scotch out of the onions in the communal loaf. The loaf waiting to be sliced. 1. In a bowl, add the flour, 130 grams of cheese, caramelised onion, mustard, salt and pepper. Make a well in the middle. 2. Dissolve yeast in water. 3. Add water with yeast and milk to flour mix. Integrate all ingredients and knead for about 10-15 minutes. Cover with a towel and leave it to rest for 1 hour or until it doubles in size. 4. Divide it into 20 equal pieces and make them into small balls. Put it in the bread pan in two rows of five balls each. Use a brush to spread butter on top of them. Put the remaining balls on top of the ones already aligned. Spread butter on them, cover and leave it to rest for 45 minutes. 5. Pre-heat the oven to 190° Celsius (374° Fahrenheit). Grate the remaining cheese on top of the loaf. Bake it for 40 minutes. 6. Eat it by itself or with anything you want on top. Last Friday I expected to get from work, have something to eat and then head out to see a presentation of the Notes on Montreal concert. This was slightly affected by my getting caught in the office for half an hour past the usual time and also for a stop at the butcher to get something to cook quickly before leaving the house again. My girlfriend even suggested we grabbed a burger in the greasy spoon around the corner, but the quality of their burgers hasn’t been the same since they made some staff changes a few months ago. So I suggested we just cooked ground beef to have with the mashed potatoes we had in the fridge before leaving (quick to make) and had burgers over the weekend. 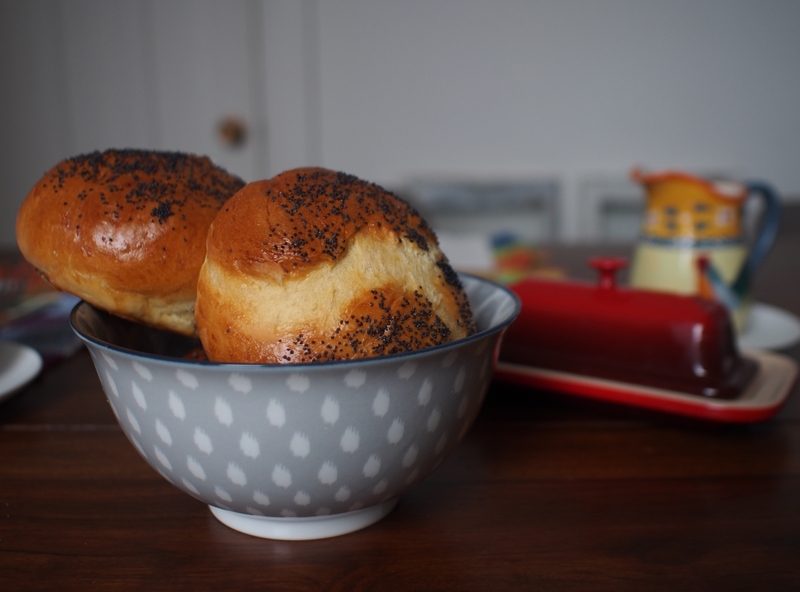 I’d made burgers at home before, but this time there would be a twist: it would involve also baking my own burger buns. We started working on it on Saturday afternoon. I used a recipe for Challah, but instead of braiding it, I separated the dough into six buns (note to self: you can make more buns with this recipe). Also, as a result of teamwork, we prepared coleslaw to go with it (she sliced what seemed like 2 kg of cabbage, onions and carrots, I slice half an apple -a big one- and mixed everything). We also scored 200 grams of raw milk emmental cheese. On Sunday, before preparing the burgers, I made caramelized onions on scotch. With all the above said, I’ll keep this text short and let the pictures do the talking. I will also include some of the recipes, starting with the burgers. To make each patty, you just take about 120 grams of ground beef, add salt, pepper and, if needed, olive oil (you need some fat in it), and mix well by hand. Leave it at room temperature for a while before grilling it. Add cheese to the top of it. Not mentioned anywhere, we also added rocket leaves to the burger. 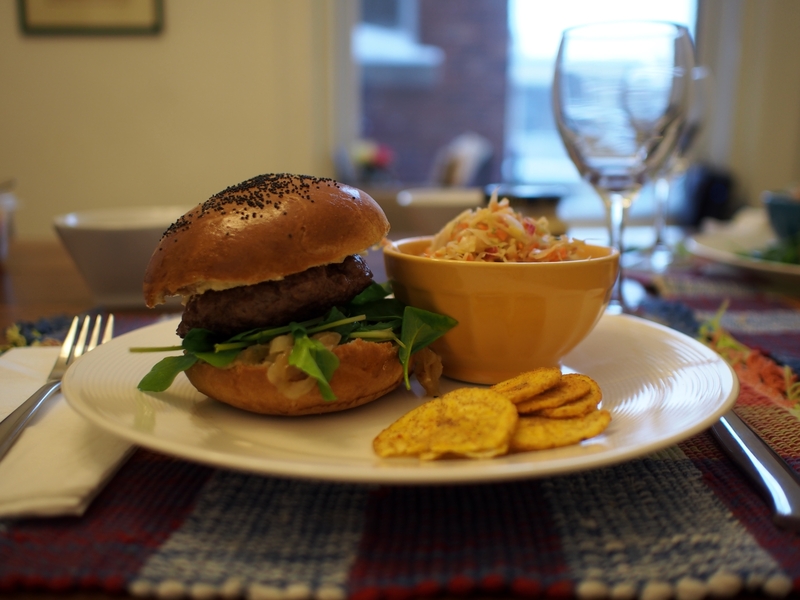 Burger, plantain chips and coleslaw ready to be eaten. 1. Add flour and salt to a bowl. In a separated recipient, dissolve the sugar in the water and add the yeast. 2. Let the yeast/water/sugar mix rest for about 10 minutes. In the meantime, melt the butter and mix in the eggs (remove it from the heat). 3. Add all the liquids to the flour/salt mix and knead until the dough is uniform and smooth. Cover it and let it rest for 1 hour. 4. After 1 hour, press the dough so it releases some of the air. Let it rest for another hour. 5. Cut the dough into smaller parts (from a quick mental calculation, eight parts should work). With the hand, make each into a ball and flatten them. Place them on a baking tray and cover for another 45 minutes. Pre-heat the oven to 200° Celsius (395° Fahrenheit). 6. Beat one egg and brush the buns with it. Sprinkle with sesame or poppy seeds. Place them in the oven and bake for about 25 minutes. 1. Chop all the vegetables. Sprinkle the cabbage with salt and place it on a colander with something heavy on top. In the meantime, put the onion in the vinegar and leave it while the cabbage drains (about 1 hour). 2. In a bowl, add all the vegetables, the mayonnaise, chopped apple and onion. Add dill seeds, salt and sugar and mix well. 1. In a small pan add the vegetable oil and butter. Heat it up until melted. 2. Add the onions and stir until they are lightly brown. 3. Add the sugar and salt and mix well with the onion. 4. Add the shot of whisky and mix until the liquid evaporates. Skip this step if not adding booze. Walk to the store, grab a bag of plantain chips, give money to the cashier and go back home. Open bag and serve it with your burger. While shopping for flour, eggs and other nutrients, I felt like getting sweets (I see a pattern here). Since I wanted to bake chocolate chip cookies for a while, this would be a good opportunity. At around 7 PM, it was time to start on those cookies. Without checking the recipe, I started gathering ingredients I could remember (I have never baked chocolate chip cookies): flour, eggs, sugar, bittersweet chocolate chips, butter… Upon checking the recipe to see if something was missing, I noticed that I would need a cup of butter (which translates to about 227 grams, according to Allrecipes), when I optimistically had 100 grams available. Considering it was -20° (Celsius) outside, I opted for adaptation and remembered that Welsh Bara Brith (literally “speckled bread”) would take most of the ingredients I had at hand. 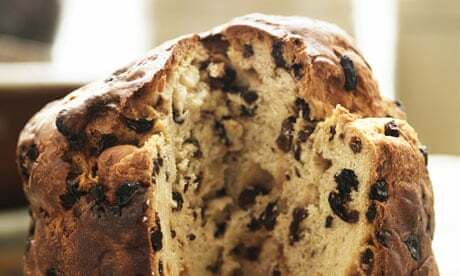 It also took raisins, which are vetoed in the kitchen by a residential decree, but part of my plan was to replace them with chocolate chips anyway (think chocolate panettone). Luckily, my girlfriend had taken advantage of some free time and an abundance of citrus at the end of the year and we had candied citrus peels (for a recipe, please check here. We kept the syrup for future use as well). 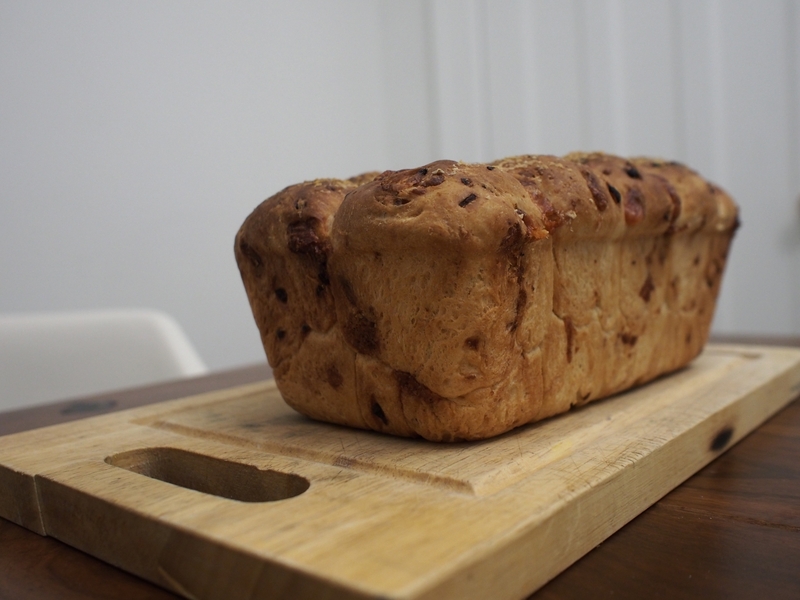 The baked Bara Brith loaf ready to be eaten with a nice cup of decaf black tea. 1. Dissolve the yeast in a bit of milk. Once it’s dissolved, add the rest of the milk and let it rest for 10 minutes. 2. In a mixer bowl, add the flour and integrate the butter. Once it’s done, add the salt and sugar. 3. Add the milk/yeast mix and the egg and mix until the dough is smooth and elastic. Cover the bowl and leave it to rest for 1.5 hour (or until it doubles in size). 4. Put the dough on a lightly floured surface and add the chocolate chips and candied peels with the fingers. Give the dough a round form and put on the baking tray. Cover it and leave it for 1 hour (or until it doubles in size). 5. Pre-heat the oven to 200° Celsius (392° Fahrenheit) and bake the bread for 30 minutes. Put the bread on a cooling rack and glaze it with the honey or honey/citrus syrups mix. Good luck in waiting for it to cool down before cutting it open. Note: My bara brith ended up a little underbaked. 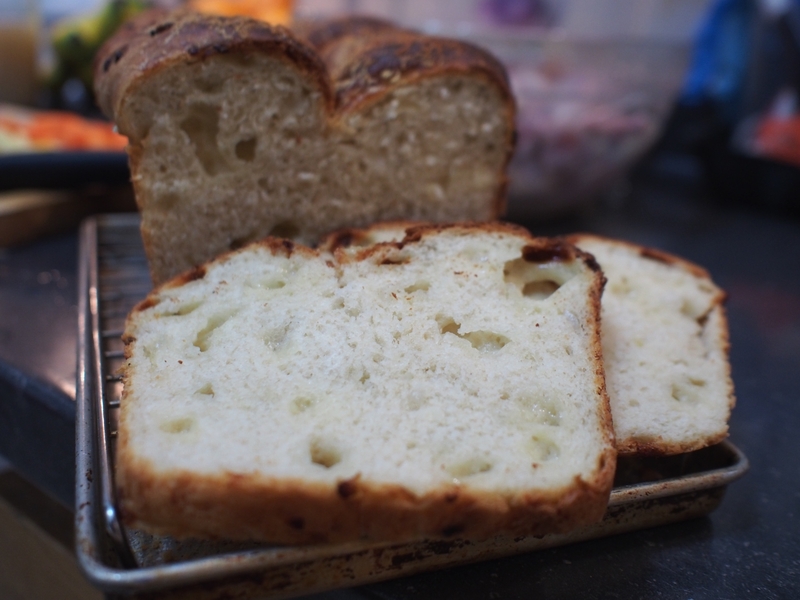 I had missed one part of the instruction where they say for step 5: “If the bread gets too dark, cover it with aluminium foil in the last 10 minutes of baking.” I fixed this by rebaking it for about 30 minutes at 175 Celsius (350 Fahrenheit). It’s a bit dry in some parts, but baked all the way through and delicious.